The British Backpacker Society: Across the Sahara' - When their package holiday to the Costa Del Sol proves to be a washout, the British Backpacker Society discovers that sunnier weather may lie further south. Therefore, abandoning the nightclubs and sun-loungers of Marbella, the team jump aboard a ferry to Morocco and soon find that a real “Coast of Sun” lies on the Atlantic seaboard of northwest Africa. 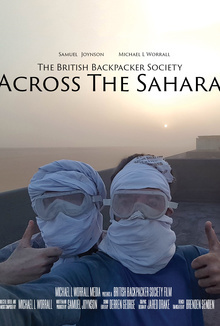 The British Backpacker Society uses any means necessary – ranging from the top of a speeding freight train to a mine-field crossing taxi – to cross the world’s largest sand-desert and follow this shoreline to Senegal. Official Selection 2018: Adventure Travel Film Festival.